Love and Dreams cabin is located on the top of a mountainous, secluded gravel road, surrounded by forest. You will enjoy breathtaking views on your way up there and may even catch a glimpse of some wildlife. Relax and unwind in our newly redecorated cabin and enjoy all the comforts of home while surrounded by the beauty of the mountains. The bedroom as well as the living room are equipped with TV, DVD player and Direct TV. 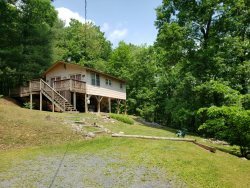 After a day on the Shenandoah River or hiking or horseback riding through the nearby George Washington National Forest, relax in the four-person hot tub or pick up some firewood and sit in front of a roaring campfire roasting marshmallows. 25 miles to Massanutten Resort, 8 miles to Luray Caverns, and about a 25-minute drive to Thornton Gap Entrance to the Shenandoah Nation Park. There are also several nice vineyards in the area. George Washington National Forest Story Book Trail is 7 miles away. Visit us on Facebook through this link. The room was perfect and honestly the entire cabin was completely clean. The bed was most comfortable bed I have slept on probably ever. If I had to pick anything the only thing was the lighting by the front door was out so it was very dark walking up. Didnt bother me to much but my wife made a comment about it a couple times. That is a simple fix. Other than that it was a perfect anniversary weekend! The cabin was so heartwarming! It was decorated just as I would have expected and just perfect!!! I would be interested in staying more often and checking out all seasons!!! Our visit was awesome! The house had everything that we could have asked for. It was a beautiful little cabin with an awesome location. We did a ton of stuff like wine tasting at the Shenandoah Vineyards, hiked Stony Man Mountain and went horse back riding! Our dogs loved the location too. They spent hours running through the yard every day. If you are looking to get away from civilization, the Sunflower is your answer. We enjoyed hiking on the AT during the day and relaxing by the fire by night. Clouds kept us from enjoying a full starry sky, guess we will have to come back! Please be advised you have rented a mountainous property. The main and secondary roads are usually paved. However, the driveway is a gravel or hard packed dirt surface. You may experience potholes, ruts, steep inclines, and rough terrain. Most front wheel drive vehicles have no trouble accessing their property from these roads as long as you drive safely and slowly. We do not recommend low profile vehicles such as sports cars or motorcycles. During inclement weather such as snow or ice you may be required to have 4-wheel drive or tire chains. We also recommend Travel Insurance during winter months. We do not give refunds for road conditions that are out of our control. We strongly recommend a 4 wheeled drive vehicle or a truck to access this property during all seasons.